Hidden Charges stories at Techdirt. stories filed under: "hidden charges"
In a complaint filed today, the Federal Trade Commission is charging mobile phone service provider T-Mobile USA, Inc., with making hundreds of millions of dollars by placing charges on mobile phone bills for purported “premium” SMS subscriptions that, in many cases, were bogus charges that were never authorized by its customers. The complaint against T-Mobile alleges that the company’s billing practices made it difficult for consumers to detect that they were being charged, much less by whom. When consumers viewed a summary of their T-Mobile bill online, according to the complaint, it did not show consumers that they were being charged by a third party, or that the charge was part of a recurring subscription. The heading under which the charges would be listed, “Premium Services,” could only be seen after clicking on a separate heading called “Use Charges.” Even after clicking, though, consumers still could not see the individual charges. According to the complaint, the information would be listed there in an abbreviated form, such as “8888906150BrnStorm23918,” that did not explain that the charge was for a recurring third-party subscription supposedly authorized by the consumer. In addition, the complaint notes that consumers who use pre-paid calling plans do not receive monthly bills, and as a result the subscription fee was debited from their pre-paid account without their knowledge. 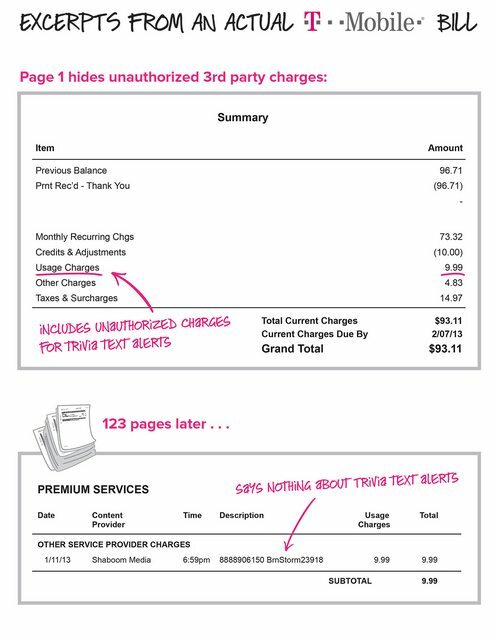 Here's the example the FTC provided showing how T-Mobile hid these bogus charges: By the way, nice touch by the FTC to use T-Mobile's trademarked magenta color in making that graphic! And, of course, the story gets worse. Even if people figured out what the hell was going on, and finally got someone on the phone at T-Mobile customer service to sort it out, the company often failed to provide them with full refunds. When consumers were able to determine they were being charged for services they hadn’t ordered, the complaint alleges that T-Mobile in many cases failed to provide consumers with full refunds. Indeed, the FTC charged that T-Mobile refused refunds to some customers, offering only partial refunds of two months’ worth of the charges to others, and in other cases instructed consumers to seek refunds directly from the scammers – without providing accurate contact information to do so. T-Mobile has done a bunch of consumer friendly things in the recent past, but these sort of practices suggest that the traditional soul of phone companies, always looking to squeeze extra fees out of users is alive and well within the company. With the news coming out this week that mobile operator Rogers was finally bringing the iPhone to Canada, almost every Canadian comment on it had something to do with just how badly everyone expected Rogers to rip people off with the iPhone. Apparently, Rogers has quite a reputation -- and it appears to be well deserved. Rob Hyndman points us to a story about the ridiculous roaming charges for those who use a Rogers device outside of Canada. Ridiculously high roaming charges are nothing new, of course. They happen to everyone, unfortunately. What's stunning, though, is that the reporter gets a guy at Rogers to admit that the company demands that all of the mobile devices it offers disable any feature that lets you see how much you've racked up in roaming charges. In other words, they know they're ripping you off -- and they want to make sure you don't realize by how much until it's too late. If ever there were a short-term strategy, this would be it. This decision most likely "gets" some travelers the first time around (as it got the reporter in the article). However, it then pisses off those users such that they'll never use Rogers mobile phones out of the country ever again. In fact, I'd bet that many start looking at other options entirely. It seems like a plan designed to drive away customers, just for a short one-time ridiculously high charge. There are certainly companies out there that believe an informed customer is a bad customer, but those companies will often find that's not a particularly good plan to stay in business over the long term.